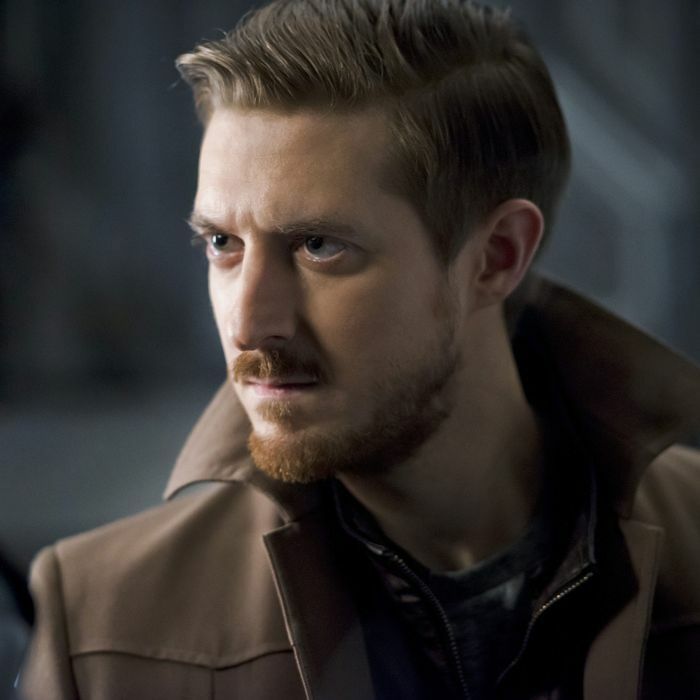 Arthur Darvill as Rip Hunter. The moment I saw another Ancient Egyptian flashback in the opening, I knew this would be a bad episode. For all the talk about creating your own destiny, Legends of Tomorrow has completely defined Kendra only by her relationship with Carter. It still amazes me how badly the writers have failed to adapt her character. But for all the strengths of the CW’s DC Comics adaptations, they often fail to properly write more than one female character at a time and struggle to craft their romance story lines. At one point Kendra says to Ray, “I should have known better” after trying to help the brainwashed Carter, and getting a boot on her neck for her troubles. She could have said this every episode and it wouldn’t have been a lie. “River of Time” is a mostly infuriating episode because it highlights the show’s greatest weaknesses, which just happen to be baked into the central premise: Vandal Savage as a villain and the Kendra/Carter romance. There is a lot going on, and nearly every character gets an important moment. But it’s difficult to enjoy the show given how boring and ridiculous its main villain and arc is. Kendra’s inability to kill Savage, even though she had the opportunity, has put everyone at risk. He doesn’t seem all that worried about being imprisoned on the Waverider. Sure, Carter being brainwashed in this life by Savage is terrible. But given the fact that he will eventually be reincarnated, it seems like a pretty bad idea to not kill Savage, which is the main mission. In the end, Savage proves inconsequential to Carter regaining the memories of his past lives, which makes Kendra’s earlier decision to spare the tyrant look even more idiotic. It’s okay for shows like this to not have a major romantic component, and I hope in its second season the writers learn not to define a female character solely by whatever man she’s with. When Carter was out of the picture, Ray suddenly became Kendra’s love interest — not because they make sense together, mind you. There just wasn’t any other dude who would work as her love interest on the ship. The relationship between Kendra and Ray has been doomed from the start. Despite the show championing free will, apparently, Kendra is destined to only have true love with Carter, just like the other version of her in the Old West episode. It isn’t just that Carter and Kendra have zero chemistry. The way this romance has been written feels sexist and has ruined a character that has been really dynamic in the comics as well as other adaptations, like Justice League Unlimited. The moment Carter came back into the picture it’s clear that Kendra and Ray won’t last. Savage is easily able to manipulate Ray using his failing romance with Kendra against him. Savage even says that in a past life, he and Kendra had a great relationship that only faltered when they regained their memories and Carter came back into the picture. Has Kendra had agency in any one of her lives? Because being destined to play out the same scenario over and over again makes it seem like she has little control over what she can actually do. If this boring romance dynamic was just a subplot, I probably wouldn’t hate it as much. But given how important Kendra/Carter are to Savage, they take up far more time than they should and eventually mess up this week’s plan of action. In going over the technology of the Leviathan, the big robot that Ray was able to take down last week, they realize its technology is a century further advanced than 2166. Which means Savage has been using time travel, which he got the idea for when he realized Hunter was a time traveler centuries ago. That goes a long way to explain why they had issues pinpointing him in the timeline, and gives Rip Hunter the bright idea to take him to the Time Counsel. If Savage has been messing with the timeline, they’re under his jurisdiction, and he will finally face justice. But Hunter has to be the worst captain ever. Any plan ends up being a bad idea. Considering Savage doesn’t seem the least bit afraid of the counsel or Hunter’s plan, you’d think the team would rethink this decision. Well, some of them do. Mick and Leonard are over being heroes and decide they want to return to 2016. Even Sara starts to believe that Hunter is willing to put them all in danger in order to save his own family (or even himself). This seems pretty undeniable when he orders Jax to fix the ship’s time drive, which was damaged because of another bad decision from Hunter. Jax is able to fix it, but gets a blast of temporal radiation that starts to age his body dramatically. There’s nothing that can be done to save him, and Sara wonders if Hunter, on some level, didn’t fix the drive himself for this very reason. Seeing what happens to Jax leads Mick and Leonard to their decision. But Professor Stein has other plans for the jump ship, which only has the ability to travel once. After talking to Savage (who underestimates him) he realizes all he needs to do is adjust the jump ship to reverse Jax’s aging so he can go back to normal. Jax would never do so willingly, especially since once they’re separated, Professor Stein will die, since he needs the other half of Firestorm. So he roofies him like in the series premiere, but at least this time it’s for a good reason. Their parting is the most emotional scene of the episode and highlights how Legends of Tomorrow doesn’t play to its strengths enough. The flashbacks are not one of those strengths, and unfortunately, they’re woven throughout the episode. We get flashbacks from almost every character’s past, most of which are unnecessary. (The brief appearance of Nyssa al Ghul was nice though.) If you’re wondering, Sara still doesn’t know her sister Laurel died. You know what Legends of Tomorrow does well? Everything with Mick and Leonard. These two are undoubtedly the voices of reason on the show and the most fun to watch. With the jump ship gone thanks to Professor Stein saving Jax, Mick and Leonard are forced to stay with the team. Things only get worse when Savage’s goading of Ray leads to a terrible mistake. At this point, Ray may be the dumbest genius I’ve ever witnessed. He thinks it’s a good idea to open up Savage’s cell in order to beat him up because he’s pissed off by the little digs at his relationship with Kendra and being called weak. Savage is an immortal dictator who has lived for thousands of years and has proven himself to be far more adept than Ray is at a fight. To say this is a bad idea is an understatement. Of course Savage overpowers Ray and is able to escape. He lets the brainwashed Carter out, then takes Gideon off-line, forcing the ship to be driven manually. At the very least, this lets Sara be captain for a moment (she seems better suited for it than Hunter). When Mick says to Ray, “If we live through this, you bumbling idiot, I may just kill you,” I practically cheered. Ray has proven to be more of a liability than a useful part of the team. The plan is still to head to the vanishing point and make Savage stand trial for his crimes in front of the Time Counsel. With Savage and Carter out, this isn’t easy. Even though it’s four (Leonard, Mick, Ray, Kendra) against two (Savage and Carter), the fight doesn’t go well for our so-called heroes. Once Savage has the upper hand he strangles Kendra, hellbent on killing her. At the very last possible moment, this somehow triggers Carter’s memories and he fights Savage. He still gets stabbed in the gut, but unfortunately, he isn’t dead. In the end, Kendra is the one able to subdue Savage. At least she’s a better fighter than she used to be. Hunter’s gloating over finally capturing Savage and taking him to the Time Counsel doesn’t last long. He and the team are still their most wanted targets. And in a twist that isn’t all that surprising, the Time Counsel has been in league with Savage the entire time. Savage gets to return to 2166, and the team is now put in their most difficult situation. How will they escape this?